This is another fabulous volume from Lorenz Books. These truly are some of the best-written and most practical cookbooks published. Each edition has a wealth of step-by-step photographs. In fact there are 650 pictures that will show you cooking techniques and the finished dish. Even experienced home cooks appreciate a bit of graphic stimulus when confronted by a new cuisine. For many the cooking of Africa and the Middle East will be new. It’s not European and it’s not Asian. It’s a cuisine, or more accurately a selection of cuisines that holds many delicious surprises. 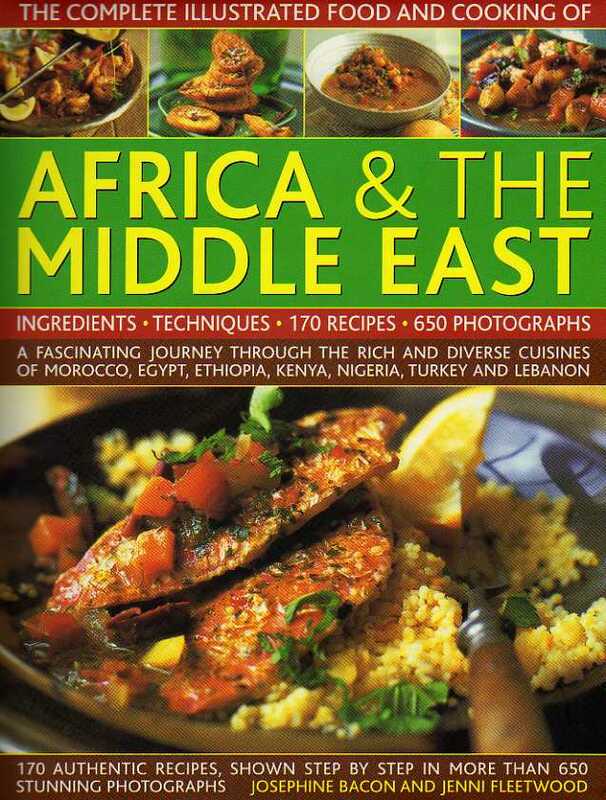 Food and Cooking of Africa and the Middle East offers 170 or so recipes for starters, soups and mezze, fish, meat and vegetarian dishes as well as sweets and breads, but the Snacks and Street Food section is a good place to start. These are stand-alone dishes so, for the novice, there is no worry about the composition of an authentic meal. Make an array of these small savouries and you have an exotic buffet. Would make a change from sausage rolls and ham sandwiches. Tunisian Chicken Wings and Oranges are tempting and simple to make. West African Akkras are made of black-eyed peas and are similar to Falafel which is ubiquitous all over the Middle East. Grilled Keftas are skewered meatballs served with a yoghurt and mint dressing. These are not hot with chilli but rather aromatic with mixed spice, the sort you use for Christmas cakes. Vegetarians will find plenty in this book to hold their attention. Classic Casablancan Couscous with Roasted Summer Vegetables would be an ideal dish for a BBQ. Okra and Tomato Tagine would be a good alternative. The meat-eaters can have some grilled lamb along with either of these dishes so you should have no complaints. Spiced Nutty Bananas from Central Africa make an exotic dessert. There is a delightful texture contrast between the soft fruit and the crunchy nut crust – an economic dessert to finish a southern African, North African or Middle Eastern meal. A lighter alternative would be the ever-popular Oranges in Syrup with orange flower water. Chill before serving for a hot-weather dessert. Ghoriba are Moroccan almond biscuits. They have the texture of crumbly shortbread and are a traditional accompaniment to a nice cup of mint tea or some thick sweet coffee. Food and Cooking of Africa and the Middle East makes truly different dishes accessible to the home cook. You don’t need to be confident in the kitchen to attempt these simple recipes. A taste for culinary adventure will allow you to enjoy lesser-known kitchen traditions. Lorenz Books have, once again, given cooking enthusiasts food for thought. It’s another amazingly good value, attractive and informative book stuffed full of tempting dishes.